It’s a Wrap … with Wrap iT! Nothing makes an organizer happier than getting organizational products AND getting organizational products that work. 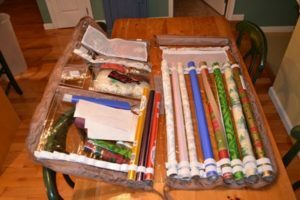 I recently received an organizational product for wrapping paper, gift bags, cards, ribbons, boxes, tape and of course scissors. It’s by Wrap iT! This product has many compartments that are wonderfully designed to hold just about everything you need for gift wrapping. I have my rolls of wrapping paper, cellophane paper rolls, sheets of wrapping paper, ribbons, shredded paper for gift baskets and much more. It has a wonderful hanger that will work nicely in your closet … or you can slide under your bed. I chose to hang it in my closet in my foyer. It’s very convenient to my kitchen where I do my gift wrapping. This organizer then zips up and has a number of compartments for storage on the front of the bag. Being that the bag is clear, its very easy to see where everything is stored. The durability of the plastic will stay strong as it gets filled to the brim! I still have more items to place in this organizer as I gather the remains of my wrapping items. Everyone needs to have one of these wonderful organizers and you can too! Just go to www.wrapitgiftbag.com and purchase yours today.